World War 1 was meant to be “the war to end all wars” only it just started another one (see World War 2 for more info.) But, how did World War 1 start? World War 1 was caused by the assassination of the ruler of the Austrian-Hungarian empire. 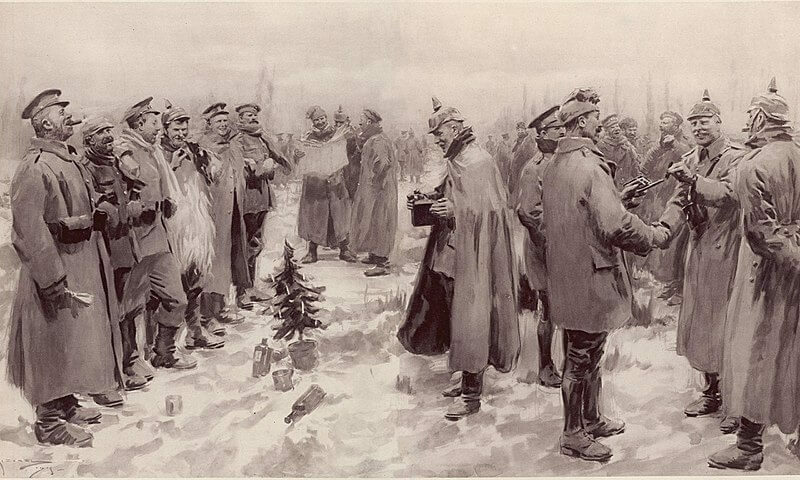 On Christmas Eve and Christmas Day 1914, soldiers from both the British and German sides stopped firing shells and guns. German soldiers climbed out of their trenches, unarmed, yelling “Merry Christmas” in English. At first, some feared it was a trick, but the soldiers were clearly unarmed, so the British soldiers climbed up into No Man’s Land. There they exchanged presents – chocolates, cigarettes and plum puddings, sang Christmas carols and played a game of football. (The Germans won 3-2, in case you’re interested!) Some used the opportunity to retrieve bodies of their fellow soldiers. A painting of what happened during the truce, where soldiers smoke cigars, exchange presents and have a good old laugh. But, sadly, by the day after New Year’s Day, generals ordered everyone to continue fighting. In the years that followed, there were attempts for a ceasefire like this to be repeated, but with no success.